Rontis participated as an exhibitor at ESPGHAN 2017 which was held from the 10th to the 13th of May in Prague, Czech Republic. The European Society for Pediatric Gastroenterology Hepatology and Nutrition (ESPGHAN) is a multi-professional organization whose aim is to promote the health of children with special attention to the gastrointestinal tract, liver and nutritional status, through knowledge creation, the dissemination of science based information, the promotion of best practice in the delivery of care and the provision of high quality education for pediatric gastroenterology, hepatology and nutrition professionals in Europe and beyond. Participating at the ESPGHAN Meeting has been a great opportunity for our company to inform the Pediatric Community worldwide, as more than 4.500 delegates from more than 90 countries participated in this event, on the latest developments of our Infant Nutrition product range: Rontamil® Complete. During the ESPGHAN meeting an e-poster presentation was given by Prof. Yvan Vandenplas Head of Department of Paediatrics, Universitair Ziekenhuis Brussel, on Rontamil® AC Complete ‘’A lactose-reduced symbiotic partial whey hydrolysate decreases infantile colic and improves quality of life’’. 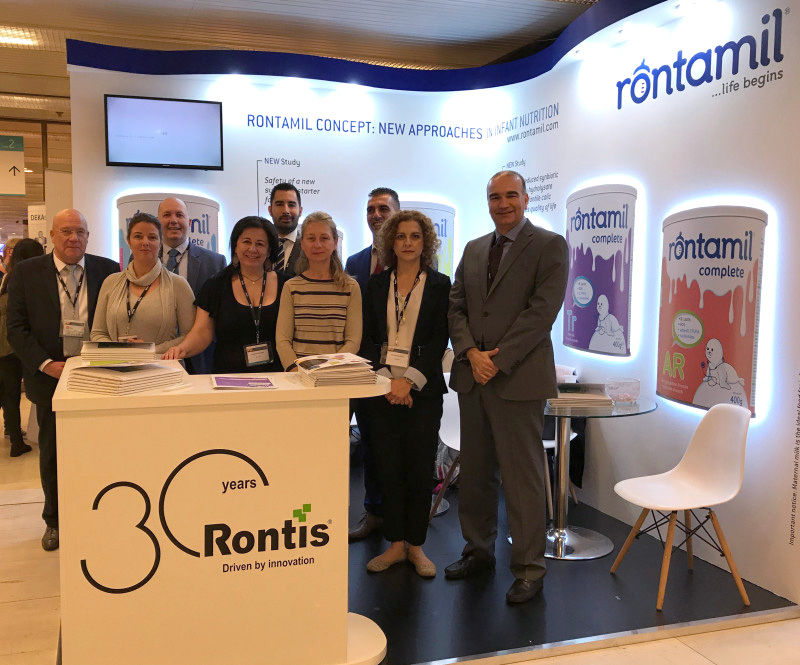 Our company was represented by our colleagues of the Swiss, the Greek and the Benelux Infant Nutrition divisions while we had a strong support from our Cypriot distribution partners who dispatched two representatives to be present at the Rontis booth during the entire event.